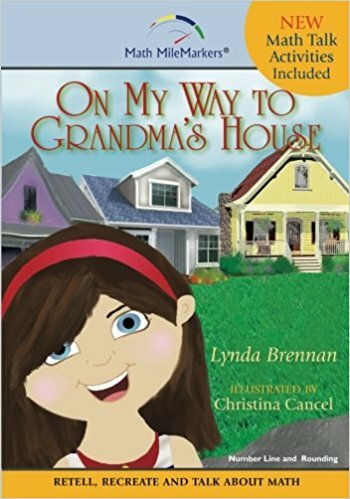 Lynda Brennan’s ‘On My Way to Grandma’s House’ (2015) cleverly introduces the concept of rounding numbers through the story of Lily River, a young girl who lives at No. 40 Cypress Road and who wants to visit her Grandma who lives at No. 50 Cypress Road. Lily’s mom reminds Lily of a family rule whereby if something ever went wrong while Lily walking to her Grandma’s house, she would have to decide whether she is closet to her mom’s house or her Grandma’s house, and run to that house. Throughout the story, different scenarios (e.g. rain when Lily walking pass No. 42, thunderstorm when she walking pass No. 44, etc.) present readers with opportunities to decide which of the two designated houses Lily should run to, and why. The story did a good job in showcasing a real-world example where knowledge of rounding can be useful for young children. The pace of the story is just right, and the writing is accessible to young children. The book’s companion website also provides useful downloadable resources (e.g. a storyboard template, a ‘talking points’ guide for teachers and parents).